WKV1220: Features: -Roamer and Zombie-14 points of articulation and a variety of removable and interchangeable parts and accessories. Dimensions: -Stand tall: 2" H-1.4" H x 4.1" W x 4.9" D, 0.2 lb. Collection: -Walking Dead collection. The dead have risen! 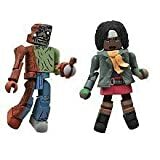 As Robert Kirkman's Walking Dead comic book shuffles past its 100th issue, DST is immortalizing the book's indelible characters with a line of highly detailed Minimates minifigures!